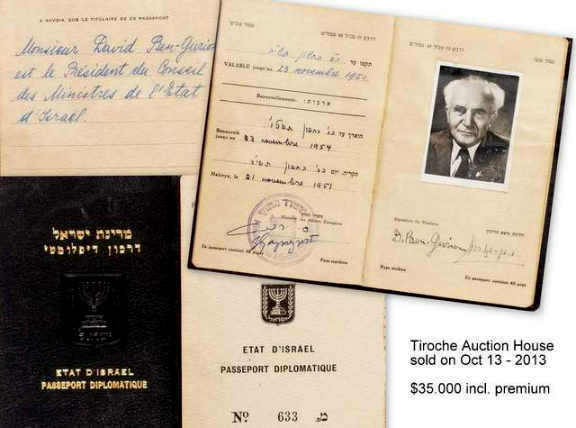 David Ben-Gurion’s Diplomatic Passport 1951 has been sold on 13. Oct 2013. I spoke to Dov Hazan from Tiroche Auction House in Israel and he told me that the document was also offered by them back in 1999 and sold for $15.000. Today, 14 years later the very same buyer was offering the exactly same passport which closed for a final of $35.000 including premium. Congratulation to the seller and buyer. Ben-Gurion (16 October 1886 – 1 December 1973) was the main founder and the first Prime Minister of Israel. In 1954, he resigned and served as Minister of Defense, before returning to office in 1955. Under his leadership, Israel responded aggressively to Arab guerrilla attacks, and in 1956, invaded Egypt along with British and French forces after Egypt nationalized the Suez Canal. He stepped down from office in 1963, and retired from political life in 1970. He then moved to Sde Boker, a kibbutz in the Negev desert, where he lived until his death. Posthumously, Ben-Gurion was named one of Time magazine’s 100 Most Important People of the 20th century. In 1970 Ben-Gurion retired from the Knesset and from all political activity, devoting himself to the writing of his memoirs in Sde-Boqer, a kibbutz in the Negev. He published a number of books, mostly collections of speeches and essays. Through most of his life he had also engaged in researches into the history of the Jewish community in Palestine and in the study of the Bible.